Here’s a two-fer that combines our feature on the retirement crisis and the healthcare hullabaloo. It’s a chart — from the Heritage Institute (.pdf) and David Leonhardt — showing just how big Medicare and Medicaid spending are going to get. Basically, 50% of all program spending will be on these two items. 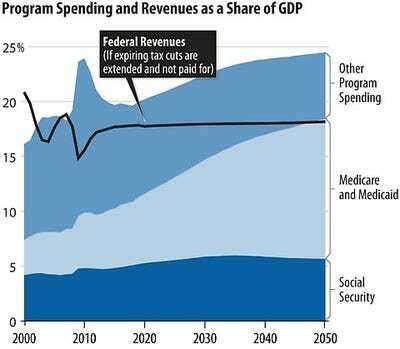 The main sources of rising federal expenditures are rising costs throughout the U.S.
per cent of GDP; by 2050, they are projected to cost 19 per cent of GDP.